In a variety of industries, PDF is a lot of meetings are to be used in the data format, PDF file contains text, pictures and tables, etc., can be directly reflected in the data contrast. So a lot of product launches or discussion will use PDF file, which can be more clearly explain the meaning of the data. Of course, a lot of information exchange between enterprises is also done with PDF. My friend is working in an enterprise, he recently got a PDF file for other enterprises, of course, this document is the paper documents, but he wanted to edit this file on the computer, he did not know how to convert the scanned PDF files to editable files. PDFelement is the all-in-one yet easy-to-use PDF editing and converting software which is written specifically for the PDF, it can be used in almost all of the daily operations. The basic problem of PDF can use this software to solve. It can help you edit, combine, convert and organize PDF. You can not only use PDFelement to quickly merge documents in different file formats into a PDF and reorganize the page, but also create several PDFs from different file formats, at the same time, each file will be converted into an individual PDF document. This software is so powerful, the operation is also very simple, what's more, be integrated with the advanced Optical Character Recognition technology, you can easily transform scanned PDFs into editable, and the selectable and searchable documents in over 20 languages. How to convert scanned PDF files to editable files? Here is a simple description of the steps, please read patiently. Step 1. First, you need to install and run PDFelement on your computer in advance. Then use this software to open the scanned PDF files you want to convert. If you receive a notification of the Yellow display, this means that you open the scanned PDF files. Then you can click the "Home" > "To Word" (or other file formats as you like) button. 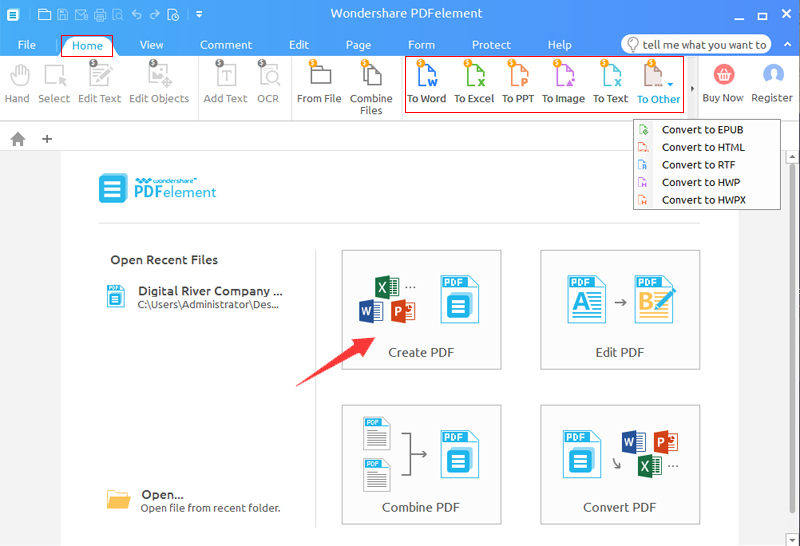 Note: If you are not using PDFelement to open the PDF file, you are directly open the software and click the "Convert PDF" box or directly drag and drop the PDF file to the main interface to add your PDF file. You can also get the "Exclamation" mark in the file to indicate to "Enable OCR" to convert as well. Step 2. In the new window, select "Enable OCR" option, and then you can select "Mode" 1 or 2. When you click on mode 1 or 2, there is a passage that tells you the details of the two patterns and the difference between the two. Step 3. Next, please click the "Options" button, in the "OCR" tab, please choose the correct language of your PDF content to convert. Finally, click the "Convert" button to convert the scanned PDF file to editable file.